This fun one-day workshop will provide a thorough introduction to some of the key skills required for Etching. 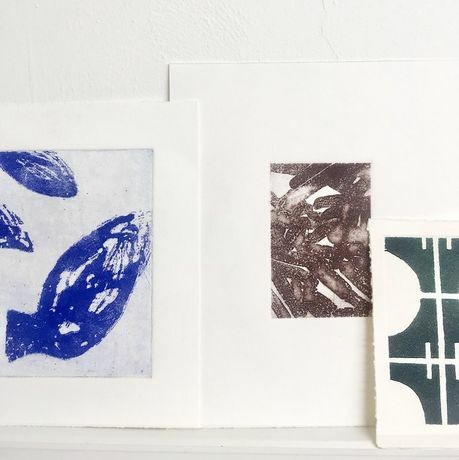 Skills covered include degreasing the plate, applying hard and soft ground to draw onto the plate, etching the plate, filing edges and learning how to ink the plate and finally how to print an edition. Phrosy will explain and demonstrate both hard-ground and soft ground techniques showing the key characteristics of both. You will then have the chance to choose which you prefer, produce your own plate and finally print your own edition. You will leave with a strong foundation of knowledge to build on, as well as your plate and a handful of your own prints. Phrosy Andrews is an established practicing artist and intaglio technician at Bainbridge Print Studios. See some of Phrosy's beautiful work here. This is a great way to get familiar with this wonderful technique in a supportive environment that gives you time and room to play and develop your printing skills.